Editor's note: HT to @Mr_Casal the purveyor of geekery who reviewed and revised this post to help ensure it was technically accurate. Livestreaming has been around for awhile making its debut with platforms like UStream and Livestream. While those platforms were powerful, they didn't take off like the next wave of livestreaming platforms which have advantages of being ad free, cost free, and a built in audience. Livestreaming's day has finally come and every innovative educator should begin exploring the power of the stream to provide students with meaningful and real learning experiences. In this post we look at three major streaming providers vying for you (there are many others…) and I provide my take on which platform is best for what you are trying to do. Periscope is a cool app that seems mostly to be used by the account holder to share what they are experiencing or doing. Periscope allows viewers to write comments that appear in the livestream providing a great platform for those recording to speak to their audience. One feature I like about Periscope is that it is integrated with Twitter, so you just log in to Periscope with your Twitter credentials. You livestream from your phone and it posts directly to your Twitter account. It’s IMPORTANT TO REMEMBER TO USE HASHTAGS. This way your livestream goes not just to your followers, but to anyone interested in the topic about which you are streaming. This means when you go live you’ll always have people watching you live. What I also like is that if you are viewing a stream you can tap the screen and hearts will appear to show your support for what you are viewing. What I also like is that viewers can comment and those comments can be moderated. In addition, once the broadcast is complete the app will give you some minor analytics; duration of broadcast, number of viewers, viewers Twitter handles if applicable, average view time, etc. They are not deep analytics but they are great to use as teaching points when discussing audience and reach. A feature I don’t like is that you can’t type back to your viewers. I mean I guess you could just talk to them, but that’s not always appropriate, for instance if you’re taping a speaker. I also don’t like that there is no way to get the link to your livestream in advance. You only get the link once you begin recording. That makes it a bit difficult to tell people where to go to watch. You have to have them follow your Twitter feed or go to the Periscope app and find you. Teachers: Posting instructional / educational videos. People can go to your account and watch your videos and follow you so they will be notified when you are live. Teachers can post themselves or share learning they observe such as at a workshop or conference. Students: Perform, cook, discuss a topic of interest. 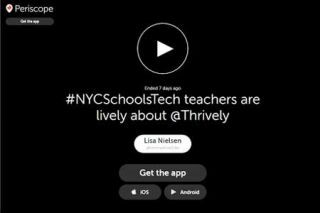 Periscope gives students an authentic live audience who can give them immediate feedback. The educators role is ensuring they know how to do so safely and responsibly and that they are aware of features such as comment moderation. Facebook Live is great for sharing something with people you are friends with or members of a group or page. You livestream right from your phone (here’s a how to) to your selected audience. If you want a broad audience and want your livestream to be shared, remember to make it public. Also, remember to tag people when you create the post. Tag anyone in the video and anyone who may be interested. Then the broadcast will show up on their timeline too unless they have selected a setting to prevent that. What I like about Facebook Live is that while you’re recording you can see people’s reactions to your video as well as their comments. Unlike with Periscope you can comment right back to commenters. You can see what it looks like below. You see 1) number of views, 2) number of reactions, 3) number of shares. In the comments you will see people from all over the world joined and discussed. Then viewers added helpful information such as urls, books mentioned, and more. That said, What I don’t like is that my Facebook Live option flat out disappeared on my Facebook app on my phone and I can’t figure out why! I can’t find a way to ask or report that to Facebook, and even the most tech savvy folks I know, can’t figure out why either. I also don’t like that you don’t know the link in advance, so you have to have a system set up for a livestream that you want a particular audience to follow. However, some strategies to do that, may limit who views. For example, you may want people in a group to know about it, but also want it viewable by the world, so if that is the case, if you post it in a private group, only those people will see it. If you post it on a page, the world could see it, but they’d have to know to go to that page. If you just post it to your Facebook Timeline it wouldn’t be as easy for all members of a page or group to find it. Especially if they are not friends with you on Facebook. Finally I don’t like that it is not easy to find your Facebook Live videos after they’re recorded. You can get to them by going to your “videos” on Facebook, but they’re combined with all videos. Better would be if there was a choice for just “Facebook Live” videos. Teachers: This is great for streaming a lecture at a conference or a speaker at a workshop. Those who can’t attend live, can attend via livestream. Students: Have students stream a poetry reading or presentation. Depending on the intent it can just be shared with a group or page that includes students and families of the school, or it can be shared with an appropriate audience of those who would be interested. You can see the first time I filmed someone on Facebook Live here https://www.facebook.com/InnovativeEdu/videos/10210088128101738/?permPage=1. This is Alan November speaking to leaders which is mentioned above. Google Hangouts On Air (GHOA) has been around the longest, but it doesn’t seem to have taken off as quickly as the other two. That may be because it got off to a bit of a shaky start when it comes to ease of use. It is easier to use today (directions to set up a GHOA), but it’s not mobile first. In fact it’s not mobile at all. You can only use Hangouts On Air from a computer. This means it’s not likely to be your first choice to record an event. Instead, this platform is good for talking heads (up to ten) that can be anywhere in the world. Caveat: while GHOA is not inherently mobile, the person who initiates the GHOA needs to be on a full OS (desktop or laptop), members of the live call can join in from mobile devices. I also like that you can edit the video right in the recording which you can’t do on the other platforms. You’d have to transfer them to record and your version in the platform would remain just as it is recorded. With GHOA, since the videos are saved to YouTube, you just edit with the YouTube editor. I don’t like that you can’t launch a GHOA from your phone. This may be by design as Periscope and Facebook can’t record from a computer. So this platform’s form specifically results in it functioning best when inside and you are a head talking to other heads on the computer. However, I think the fact that you can’t begin a stream from a phone is part of the reason this platform has not taken off as quickly as the others. For those out-of-the box thinkers, Robert Cortes an #NYCSchoolsTech SPOC created the hack in the video below to record Google Hangouts On Air from your phone or tablet. Teachers: Google Hangouts On Air provide a great way to organize a virtual conference. All the sessions were scheduled on the calendar and when the hangout was to begin, you just tune in! You can see what this looks like with EdCamp Global here: http://edcampglobal.wix.com/edcamp#!schedule/c1204. Students: Use GHOA for book clubs. Let students in your classroom and others discuss a book together ensuring they have a list of discussion topics to hit on, then they can watch the discussion afterwards and reflect on how it went. The teacher can jump in their too with advice and strategies to focus on as well as share what went well. Think about connecting students with students from another state or country that may have a different perspective on what they’re reading. Podcasters (students and/or teachers): You can use GHOA to broadcast your podcast while you record it. It is a great way to broadcast the un-edited version of a podcast, and give your audience an opportunity to contribute in real-time. The Techlandia podcast uses GHOA as their main podcast creation platform and as a way to engage their audience during the production phase. Example: You can see my Google Hangout On Air videos here https://www.youtube.com/user/InnovativeEdu/videos?flow=grid&view=2 where I talk about using GHOA versus other platforms and BYOD. Update: You've gotta love technology. As I put this post in the queue for publishing, Google announces that Google Hangouts on Air is moving to YouTube Live starting September 12. We can all figure out what that means in the upcoming months and readers of this blog can stay-tuned for an update on how that works. For now, details are at https://support.google.com/youtube/answer/7083786. Here is advice for schools managing YouTube: http://googleforeducation.blogspot.com/2016/04/more-ways-for-schools-organizations-to.html. Innovative educator, Chris Casal warns that in its current state YouTube Live is not nearly as easy to set up as Hangouts on Air. He shows how he put it in action in this post http://blog.mrcasal.com/2016/05/live-streaming-1st-grade-egg-hatchings.html. I tried to make a run of it which you can see below. So far, I'm not a fan.